If anyone ever tries to convince you that making and filling eyebrow pencils isn't a bit of a messy job, don't believe them. 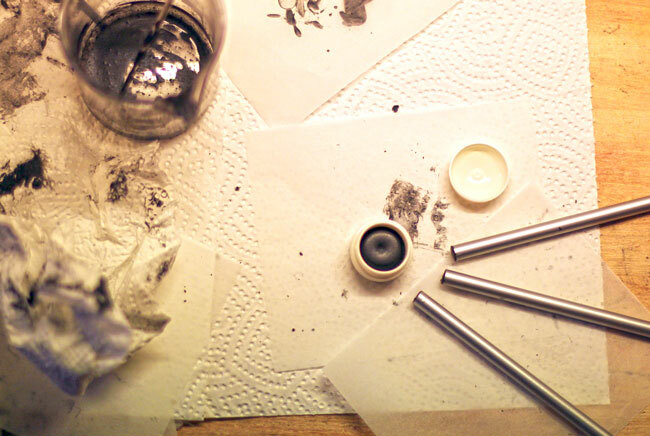 Here's a peek at what went on during a recent pencil-making day. I normally do a 'bulk amount' of pencil base once a year (the cup in the center of the pic below – about 60 grams). Being able to quickly whip up a pencil or lipliner any time inspiration might strike is my main motivation for scheduling an annual lip-and-eye-pencil-base-making-day. Last year, however, I was exploring other things and just never got around to making one. The base I used for this batch is coming up on 2 years of age. And even though it is a 100% fat-based mixture and has been stored in ideal conditions, it is preservative-free. I did think twice before using it. Then I remembered my husbands still functioning 5 year old lip balm and decided to use this as an opportunity to test-run some recently aquired pencil casings. The grey pigment mix in the little jar was made in a previous session. 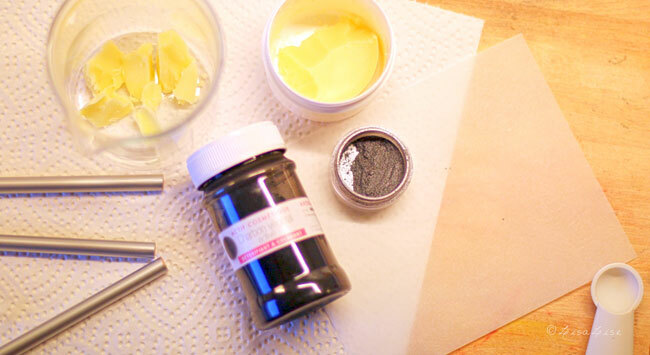 I combined it with activated charcoal to create a dark smokey grey color. 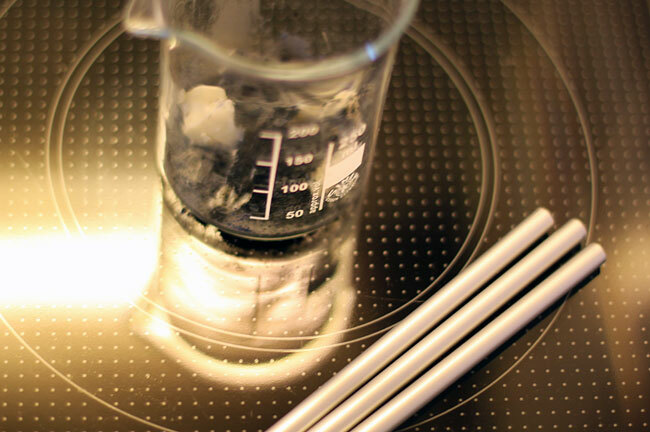 In the beaker, the measured amount of pencil base is ready to be melted. The pigments are added directly to the base mixture - no sifting necessary – just stir thoroughly. Melt slowly over low heat until the mixture is fluid. Tip: When working with wooden pencil casings, warm them before filling. Here, they are placed close to the heat source and rotated regularly for a minute or 2. When the casing feels pleasantly warm to the touch, it's ready. A warm casing aids the filling process. If the pencil mixture sets too quickly while being poured, an unwanted plug is created in the pencil. 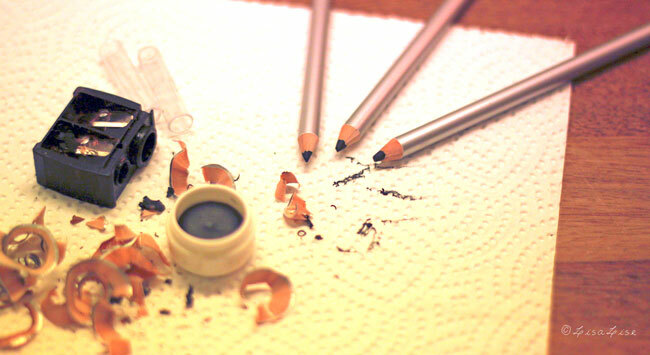 The process of filling pencil casings has always been a bit of a challenge for me. Admittedly, I don't make pencils all that often, so I've never done it often enough to really get into practice. I've never had the best of luck working with syringes and seem to get best results by pouring. Pouring inevitably causes a bit of clean-up. Despite the mess, the result (pictured at the top of this post) was 100% satisfactory. No air pockets and easy sharpening. And yes, I will using the pencils until I do get this years pencil base made. Do you have any tips for filling pencil casings? I'd love to hear them! On youtube, there is a guy called enkoremakeup, he has videos showing how to fill the pencils using a syringe/pipette. There are 2 videos, 1) DIY Homemade Eyeliner Pencil V1 2) DIY Homemade Eyeliner Pencil Version 2. Hope this helps. Thank you Robyn! I am going to check this out!